A portrait of George Washington is attributed to Gilbert Stuart, who made a living creating as many as 100 copies of the famous painting. It's for sale at M.S. Rau Antiques in New Orleans, part of the 'Sea to Shining Sea' exhibit up through June. Benjamin West's 'A Mighty Angel Standeth' shows how the first half-century of American art was marked by a strain of the mystical. And as a new exhibition at M.S. Rau Antiques in the French Quarter illustrates, art — or more precisely, a particular kind of portrait and landscape painting — has always been an integral part of America’s understanding of itself. “From Sea to Shining Sea” includes nearly 100 paintings and a handful of other objects covering the period from the Colonial era to the early 20th century. Not everything is a masterpiece. But there are a few works that approach top-tier status, and to have them on view in a handsomely produced, free exhibition in a busy stretch of Royal Street in the French Quarter feels like a particular coup for casual visitors and deep-pocketed collectors alike. The star of the show is a portrait of George Washington, attributed to Gilbert Stuart, which Rau calls “perhaps the most recognizable American painting ever made.” Famously, Washington was adjusting to a new set of dentures when he first sat for Stuart in 1796, which accounts for his slightly swollen lips and somewhat pinched expression. Visitors will encounter another familiar likeness in an 1865 portrait of Abraham Lincoln by David Bustill Bowser, one of the very few African-American artists of the period to achieve renown. Based on the famous photograph of Lincoln that was later used as the basis for his portrait on the five-dollar bill, there’s an appreciable tenderness to the portrait that is missing from the more familiar versions. It’s also notable for being one of the relative few portraits of Lincoln painted during his lifetime, even fewer of which were painted by African American artists. 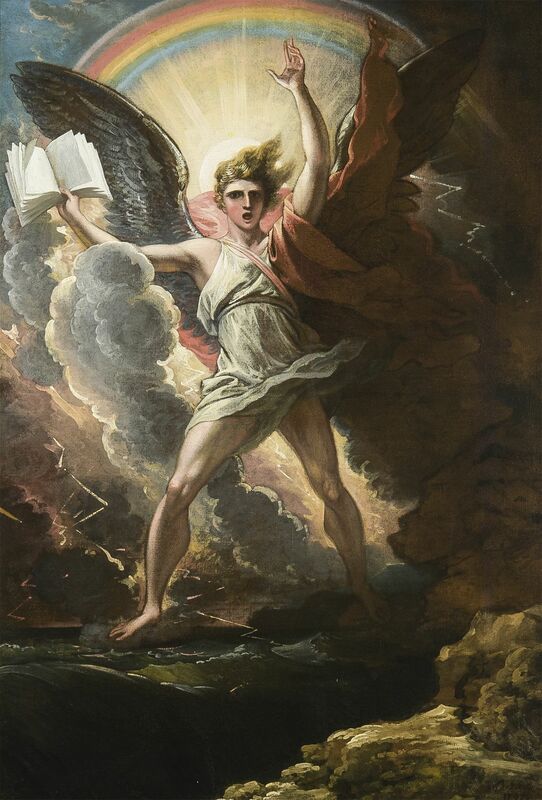 Benjamin West’s “A Mighty Angel Standeth” is another standout piece in the show, a brightly colored and almost electric image of a divine personage bursting forth from a riot of clouds and rainbows. Along with Thomas Cole’s study for a painting in his “Voyage of Life” series — which comprise Cole’s best known body of work, now in the National Gallery of Art in Washington, D.C. — West’s piece shows how the first half-century of American art was marked by a strain of the mystical and transcendent. Also look for a small oil sketch by Frederic Edwin Church, the leading American landscape painter of the mid-19th century. It’s a view of Chimborazo, a mountain in Ecuador that was the subject of one of Church’s most impressive canvases https://www.huntington.org/chimborazo. The diminutive size of the study in the Rau show, however, makes it a more intimate counterpart to its 8-foot-long final version: more of a picture postcard than a Cinemascope extravaganza. The back half of the show features works by American impressionists and early modernists like Winslow Homer, Childe Hassam and Mary Cassatt: mostly pleasant pastoral and urban landscapes with a smattering of portraits and still lives that, while attractive, don’t make as much of an impact as the earlier works do. Viewed as a whole, however, “Sea to Shining Sea” is an impressive collection, and one that M.S. Rau owner Bill Rau hopes will inspire viewers to a higher purpose. One oft-repeated cliché holds that it’s the little things in life that count, while another says bigger is better.